Working in an industry that uses glass and polycarbonate for structures and openings in the roof, we know a lot about heat gain and heat loss. It’s a big concern for almost all of our customers, especially when considering the impact on potential LEED certification. WHAT IS HEAT GAIN AND HEAT LOSS? Heat loss, measured in kW or BTUs, reflects the total transfer of heat through the fabric of the building from the inside out. Since we manufacture structures from aluminum and glass or polycarbonate, the information in this article will deal only with these elements. Although heat loss and heat gain can happen through any part of the building’s envelope. The opposite of heat loss is heat gain, also referred to as solar gain. 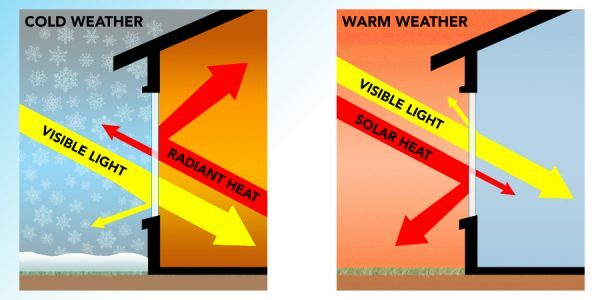 Heat gain occurs when when warmth comes into the space via radiant heat as the sun shines through the glass. It’s also a sign of a low U value rating. Heat gain also occurs as cool air escapes through seals. Knowing what heat loss and heat gain is, how to reduce it, and what it means when specifying the type of glazing for a skylight, solarium, greenhouse or the like, will help to answer many questions about the internal building environment. Many times, the benefit of a skylight or glazed structure is that you can get the light and warmth from the sun to help offset the costs of electricity and heating oil. It’s true that in Northern climates the heat gain can help other heating systems perform better, increasing overall comfort in a room. But for the glazed structure to actually be of benefit to keeping a room comfortable, the glass or polycarbonate must provide enough heat gain to offset any heat loss – through the same glazing. HOW IS SOLAR HEAT GAIN AND HEAT LOSS CALCULATED? So if you have a product with a low U value and high R value you can be sure it has less heat loss and will then help keep the room warmer. If you have a lower solar heat gain coefficient, the glazing will gain less heat, thus it helps keep the room cooler. WHY IS HEAT GAIN AND HEAT LOSS IMPORTANT? Different climates have different needs as well. So if you are building a glazed structure in North America you’ll want glazing with a high heat gain to help warm up the space. But if you are in Florida or Arizona, you’ll want glazing with a low heat gain. Carefully planning for heat loss and heat gain will save you money. It can reduce heating / cooling costs while giving you the benefit of an additional daylight source. We recommend low emissivity (Low-E) glazing with a low U value to help keep heat gain or heat loss within acceptable levels. For additional information on glazing options that offset heat loss / gain, please review our High Performance Glass charts. If you have questions about which type of glazing would be best for your project, contact us! Previous Post: What makes your garden grow?